Kalamkari one of the most traditional art form of India is noted for its extraordinary beautiful hand paintings on fabrics. The word kalam means pen and kari means work according to the language of Hindi. The kalamkari artists make use special pens which are particularly crafted for this purpose from the bamboo tree. Once the textile is ready after the weaving process the fabric is mixed in a blend of milk and natural dyes and then the required design is done with the help of the special pen. The outcome of the paintings of kalamkari is very detailed and complicated. The patterns and the designs done on the fabric are very colorful and vibrant and are mostly natural vegetable dyes and synthetic colors are not used in kalamkari.The Kalamkari paintings are widely distributed in various products like saris, drapes, hand towels, wall paintings, prayer rugs, wrappers, bed covers, door covers and dress materials. In olden days which dates back to the period between 13th and 19th centuries in Andhra Pradesh specially in the state of Andhra Pradesh where groups of singers, musicians and painters, called chitrakattis kept moving from village to village only to depict the stories of Hindu mythologies in the form of street plays and generated income for their living. The chitrakattis slowly came up with new ideas for the better understanding of the people where they staged their plays using large bolts of canvas painted on the spot with basic means and dyes extracted from plants. This is how kalamkari was introduced in the country. Then many Hindu temples started having large panels in the temple premises with kalamkari work on it illustrating the episodes of great Indian mythology just similar to that of the stained glasses of the Christian cathedrals. Kalamkari soon flourished as an art form which found its culmination in the middle ages during the reign of the rich Golconda Sultanate of Hyderabad. The Mughal rulers of Golconda and Coramandel Provinces appreciated and patronized the art of kalamkari and also called the skilled craftsmen of this craft as "Qualamkars". 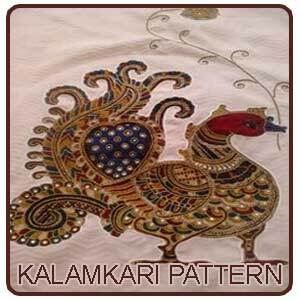 It is from the word "Qualamkars" that the craft form got its name kalamkari. Soon the products of kalamkari paved way for trade and commerce in ancient India concentrated mainly in the province of Andhra Pradesh. Sri Kalahasti and Machilipatnam were the two major centers for kalamkari work in Andhra Pradesh. Water being one of the most essential components for the kalamkari art among all the centers, Sri Kalahasti emerged as a major center for kalamkari work because of the steady supply of clean flowing water it received from the river. 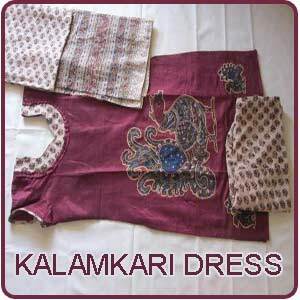 The kalamkari had demands both from the domestic and international markets and was exported to different parts of the world resulting in major source of trade. This form of Indian textiles was also used as a form of currency in spice trade in ancient times. Being required even in other parts of the world the artisans of kalamkari also had to modernize with new ideas and themes. The artisans came up with innovative patterns and ideas highly influenced by Persian motifs, Hindu mythology and religious symbols. Kalamkari art has been practiced by many families in Andhra Pradesh and over the generations has constituted their livelihood. But in the year 1950 the art of kalamkari had a major setback and almost became extinct due to ignorance and revived back only because of the demand from the international market by the efforts put by the government and crafts men behind these paintings. During the British period they had lot of affinity for this art and they started using this as a decorative element for clothing. The art of kalamkari which saw its peak during the period of the Mughals and the Golconda Nizams involves both hand and block printing mainly done on cotton fabrics. The artisans never use synthetic dyes for only natural and vegetable dyes are used in kalamkari. The word kalamkari is more of a Persian term than Hindi. The two main forms of style derived from the kalamkari art are the Machalipatnam Style and Srikalahasti Style where the process of both the forms is the same as kalamkari painting. The Machalipatnam style involves the procedures of block printing whereas the Srikalahasti Style is little complicated than the latter. Patterns drawn in the Kalahasti style is more of free hand drawing using the pen and further the filling is also completely done with hand. The filling of these drawings are completed using natural dyes and it includes nearly 17 difficult steps to complete. The quality of the fabric used for kalamkari is of good quality for it can take up even 20 washes without any diminution. The glossy effect of the fabric is got from the mixture of resin and cow milk in which the fabric is kept soaked for at least an hour before starting the process. Varying effects are achieved on the fabric by the usage of cow dung, seeds, crushed flowers and different varieties of plants. The cloth has to be washed after every single application of the dye. The outlines for the designs and pattern are done using iron fillings and molasses. The color pattern used in kalamkari is unique and follows different themes. 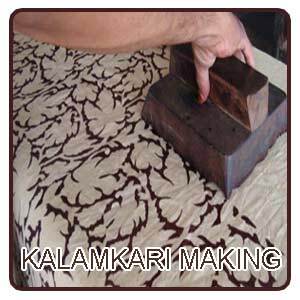 This is one of the main features of kalamkari art. Women figures are always depicted using yellow colour, Gods in blue, and demons in red and green. The backgrounds are generally red with motifs of lotus. The most common theme followed in kalamkari is religion exhibiting magnificent paintings of sun chariots, famous deities and scenes from great epics - Ramayana. Mahabharata and great Indian mythological classics. Bed covers, curtains and other home furnishings are mostly designed using the Machalipatnam style of Kalamkari art. Since this is carried out with hands no exact similarities can be seen in two different panels. The paintings of kalamkari stands as a representative of natural color artwork which are mainly extracted from bark, flower and roots of plants and they strictly say no to synthetic and chemical dyes. The red color used is obtained from Indian madder root, yellow from the pomegranate seed or even mango bark, and black from myrobalam fruit. The paintings of kalamkari are sure to enhance the viewer's memories. So the use of pigment dyes is getting quite common among the kalamkari.Minerals are also used as mordant- mineral salts of iron, tin, copper, alum, etc. The predominantly used color in kalamkari is red, yellow, blue, green and black. The Kalam or the pen used for this art is the reed of a bamboo reed, the tip is rolled with a woolen rag and is made fixed by entwining of cotton thread. It should be noted that the tip of the pen should always be thin and sharp so that when the pen is dipped in to the dye solution, the woolen ball absorbs the dye. The pen is then held in an upright position and the artists gently press the woollen ball and drag it on the cloth along the required design.When this is done the dye makes its way out of the woolen ball, passing through the bamboo point finally reaches the cloth. The Machalipatnam Style which followed block printing initially had more of Persian motifs and later when it got influenced by the Dutch there was a lot of demand from the European market.Srikalahasti Style had more of motifs and they were hand painted which was more influenced by the temple region and its related stories. The Karrupur style of kalamkari is also getting recognized by the public and can be identified with the embellishment to the gold brocade work in the woven fabric which was most commonly used by the Royal families during the period of Raja Sarfoji and later Raja Shivaji. Another most popular motif used in kalamkari is the tree of life. This art requires lot of sunlight as these paintings can be dried only under direct sunlight. Both the Srikalahasti and Machilipatnam style of kalamkari varies slightly in its processing however for both the techniques and the materials used is the same. In Srikalahasti, the cotton cloth is washed thoroughly with water to remove any dirt or grease in it for effective painting. Then it is sun dried and when it is dry it is once again soaked for few minutes in buffalo milk mixed with myrobalan fruit dust. This is once again followed by drying after squeezing out. Then the tamarind tree twig is used as a charcoal pencil to draw the initial drawing. Then a pen trimmed down to get a sharp tip is made from the bamboo stick is got ready. A cotton cloth is taken and tied at the sharp tip of the pen using a thread. The outline of the painting or the drawing is drawn from a solution called as kais which is got by mixing 500gms of sugarcane jaggery, 100gms of palm jaggery and 1kg of rusted iron in 10 litres of water. This solution has to be prepared much earlier at least before 21 days of starting to use the kasim into which the pen is dipped, squeezed and used for drawing over the cloth surface. A piece of cotton is always kept handy to blot the excessive ink from the surface. The colors are decided and the area which to be painted using red color is treated with a solution of alum water for the most common background in kalamkari is red. Whenever maroon color is required a very small amount of kais is added to the solution. The solution is applied to the cloth with a blunt pen. Alizarin is a solution which has to be prepared separately by diluting 50gms of alizarin which is then mixed with at least 15 liters of boiling water. The cloth, drawn with kais and alum solution is dipped into the hot water and kept for around 45 minutes. The clothes are then washed in the nearby water body preferably a river and then allowed to dry on the river banks for at least three days. Once the cloth is dried it is once again dipped in the buffalo milk. For yellow, dust of ripe myrobalan fruit, mixed with alum solution is used, for blue indigo is used and so on. Finally the fabric is once again washed before it is used.In the Machilipatnam style the initial procedure done of washing the fabric and sun drying is the same as the Srikalahasti style. Since this style follows the block printing method which does not require drawings of line for each colour separate blocks are used. The unit involved in this style is further sub divided into sub units. The block makers are those who work in the first sub unit where small blocks are made from teak wood by artisans from the carpenter's community and they are featured by lyrical lines which gives the design pattern. The wood surface is coated with white solution and then the design is transferred onto it. Thus when printing is done with these blocks the area of printing or the positive area is embossed and the negative area is suppressed. Next comes the printing sub unit including the process of coloring the outlines and then filing with color. For varied color printing black and red are first printed followed by washing and boiling of the cloth. The dyes or the colors are kept in rectangular wooden vessels which are then covered with several layers of cotton cloth or jute. Care should be taken during the process of printing so that the block touches only the layers of cloth. Once printing is done the fabric is dried and then goes into the washing sub unit which is open on four sides and has two or more ovens fuelled by rice husk and wood powder. Now huge iron vessels are placed on the oven and the fabric is left to boil along with a leaf known as gaja which helps fixing the colour to the cloth. After boiling they are dried and again sent for further printing. Then the next stage of printing of other colors like yellow, blue, etc. is done and finally washed in boiling water and finishing touches are given to the fabric. During the 17th century there was lot of demand for the Kalamkari from other international markets like Iran, Siam, Burma, Maldives, Malacca and Europe. But in-between there was great dip the international trading port was reduced to a fishing village. With the coming of the British there was again a demand for the fabric which was used by them as a decorative element for clothing. However soon the problem was analyzed and the government and various NGO organizations took steps for its betterment. This art of kalamkari is the bread winner for many families in the state of Andhra Pradesh and has been passed on to generations which have comprised their livelihood. But it is such a sad thing that we know very little about the challenges faced by the artisans of kalamkari. Kalamkari are not only available as materials for clothing but also it has emerged as home furnishing fabrics too. In any government recognized kalamkari store, kalamkari painting of religious deities like Goddess Durga slaying the demon Mahishasur will cost about 2,866.INR, a 12X12 pair of Kalamkari cushion will be priced between 650 - 750 INR. Pure kalamkari fabric is available at all Fab India outlets for Rs.1, 090. With an approximate price of Rs. 80-100 per meter for block print. The latest trend in kalamkari is the stole produced from this fabric which has great demand among both the teenagers and aged people. The Kalamkari Printers Welfare Association of Machilipatnam works under the registration certificate got from the GIR Chennai which declares that this art is been recognized as 'Machilipatnam Kalamkari'. This registration helps the Printers Welfare association to legally fight against those who copy the art or design in any form. The registration act also controls the production of fabrics with Kalamkari art in the areas falling out of the registered geographical area and is supposed to be carried out only in the surrounding villages of Machilipatnam, Polavaram and Kappaladoddi in Guduru mandal of Krishna district. The entire process of the production of kalamkari submitted to the GIR for maintaining the parameter of the art as well as easy identification of violators anywhere. 10. Meena Bazar , Near Tilak road, Abids, Hyderabad, Andhra Pradesh.